I grew up when there was no such thing as a mudroom (and there wasn’t much need for one either). As a kid I entered my small ranch home at the side door (which BTW had a built-in milk chute – if there is anyone else out there who remembers what one of those was for). I simply flung my coat over on the available hooks by the side of the door and that was that. I didn’t own a bookbag. I don’t even remember anyone having a bookbag back in the late 60’s (ouch, I’m dating myself here). I walked to school with the books under my arms. And I walked to school uphill, both ways! Those were simpler times. We had simpler (and fewer) storage needs. No bookbags. No electronic devices. Much fewer coats and hats. Our lives were simpler. Our homes were smaller. What I can say today is this is NOT the world I (or probably you) live in. With 3 kids, 3 furry kids (AKA cats), 1 wife (no I’m not a Mormon) book bags, multiple coats, too many cleaning supplies, and electronic devises which need to be stored and charged, our home is screaming out for a mudroom system to keep things (and our family) straight. 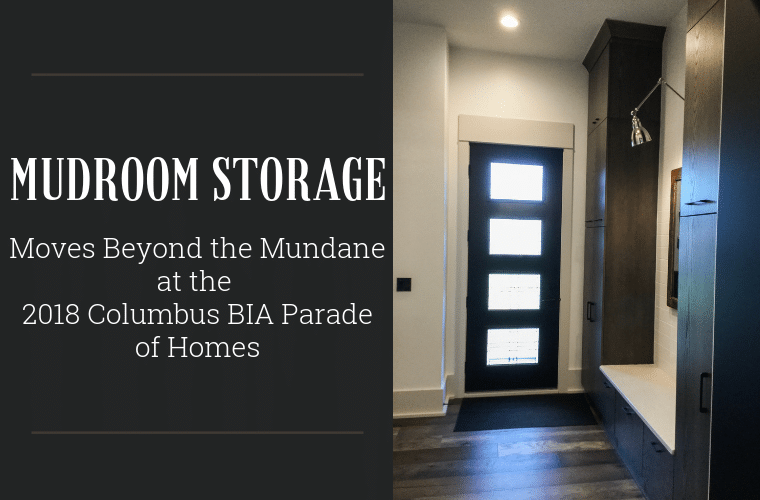 When I went to this year’s 2018 Parade of Homes in the Jerome Village development in Plain City (outside Columbus), I saw first-hand how Central Ohio custom builders ‘get it’ when it comes to the urgent need for busy families to have a ‘command central’ space (AKA a mudroom cabinetry system) to keep life in order. To have a place for storage. To have a place for cleaning supplies and electronic devises. A place to communicate with your family, who always seems to be on the run. This place is a custom mudroom. What’s unique is these builders designed their mudrooms to move beyond the mundane (the functional) and added fun and fashionable elements as well. 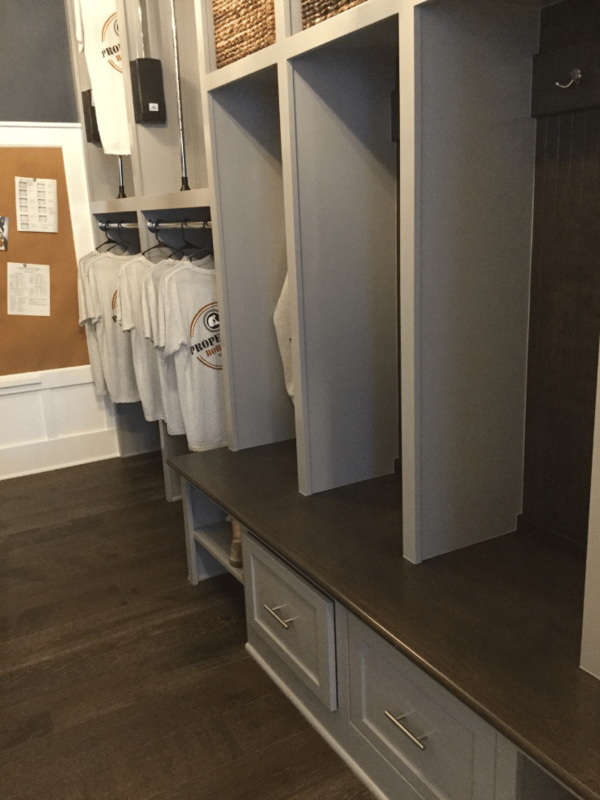 In this article I’ll show you 6 unique features of the mudrooms in this year’s Parade. At the end let me know which builder you think ‘knocked it out of the park’ with their designs. Also hit me up with any questions you have about designing an efficient, effective and (dare I say) exciting mudroom for your home (even if your place doesn’t have the $1,000,000 price tag of these Parade homes). Let’s face it, you enter your home from the garage through the mudroom. Friends and family always use this entry. The only people using your front door are unwanted solicitors selling subscriptions to God-knows-what. Given the constant use of this back-door entry area – why shouldn’t it have style? This was exactly the thought of the team at Manor Homes. 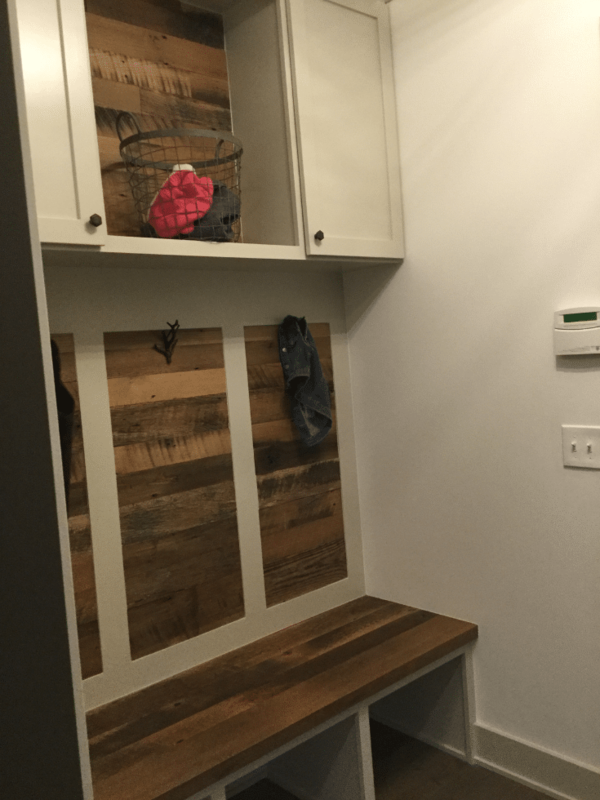 In this open cubby mudroom storage unit, they added a wood feature wall to go with the 1” thick wood seat top. For an added touch I love the ‘branch’ hooks to hang coats. A small – but fun – element. The Shaker style cabinets at the top provide a place for out of season (or excess kitchen) storage. Who doesn’t need more storage? Another variation on this same theme was used by Memmer Homes. The gray wood colors are fashion-forward and inviting. It’s trite, but true, the devil (and the divine) are in the details. And it’s a tiny detail which caught my eye in this entryway by Romanelli and Hughes. Instead of having the ‘same-old, same-old’ hook you see EVERYWHERE – they mixed it up with this sleek contemporary choice. Especially in Columbus (a town we might call 50 Shades of Beige since most of the homes look alike) these contemporary coat and book bag hooks stand out for their minimalist and simple design. Well done Romanelli and Hughes! In a perfect world you’d have TONS of room for an expansive entryway or mudroom. If you’re reading this right now you’re probably saying, ‘the perfect world is not the world I live in!” I can totally relate. My home was built 23 years ago and the only ‘entryway’ I have off the garage is a 36” narrow hallway! 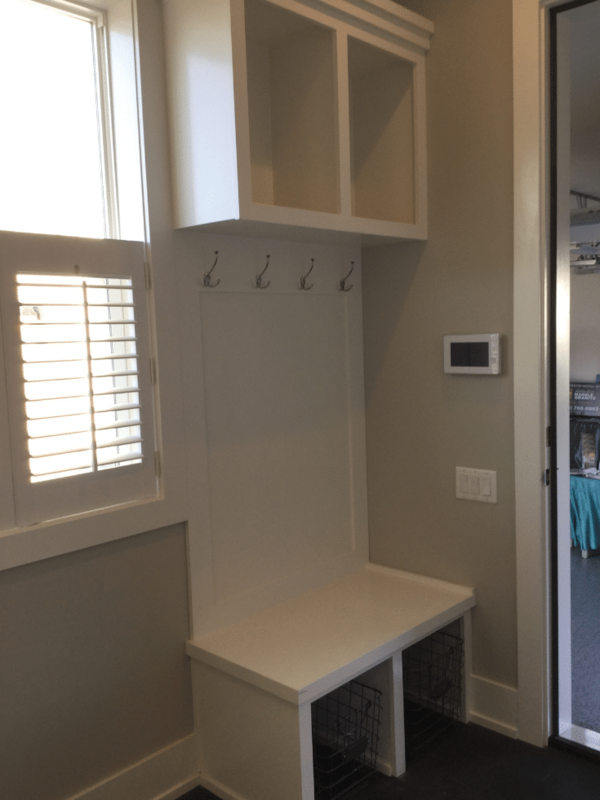 With that being said, the key to a successful mudroom is to effectively use the space you’ve got. In this home by Arthur Rutenberg a small mudroom seating and storage area was combined with an expansive laundry room. 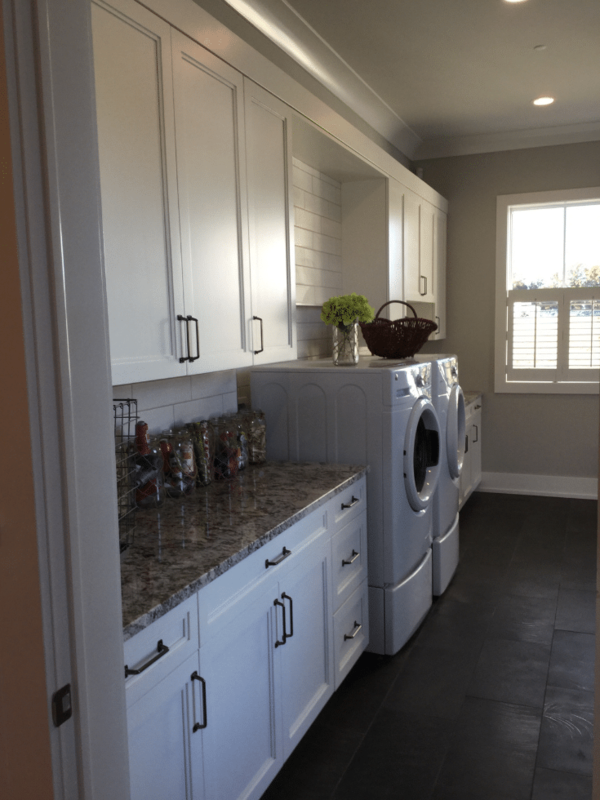 While the open locker and cubby style entryway was tucked into the corner – this design allowed the room for a large bank of windows for this combined laundry and mudroom. At least the windows help take your mind of the drudgery of doing loads of clothes – and as a bonus there’s a mudroom system which works! Do you recognize this problem in your entryway? You’ve got too few hooks and waaaaaay too many coats. You’ve got coat after coat after coat stacked on top each another. You’re wading through the piles of your kids and spouse’s coats, scarves and book bags desperately searching for your coat as you’re running late for work. This problem is you lack hanging storage. I liked the solution used by Columbus custom builder Bob Webb. With an ingenuous pull-down wardrobe rod, they went ‘vertical’ and created 2 levels of hanging storage. The pull-down feature helps ‘vertically challenged’ family members use both the lower – and the upper- hanging rods. Nice idea! ‘Trying’ to keep up with commitments with your kids, spouse, home duties and career is a MAJOR CHALLENGE! Soccer practice for Breanna at 5:30. Pick up Joel from Band rehearsal at 7:00. Don’t forget the organic spaghetti sauce and your favorite dress at the cleaners for the board meeting tomorrow. Trying to remember everything (and not forget your kids somewhere) is a task. Since the mudroom (and garage side door) is what you usually see last (when you leave) and first (when you come back in) it’s perfect place for a ‘family communications center.” A place to post notes you and your family (who seem to suffer amnesia and ADD) need to remember. The builders in this year’s Parade understand this need. 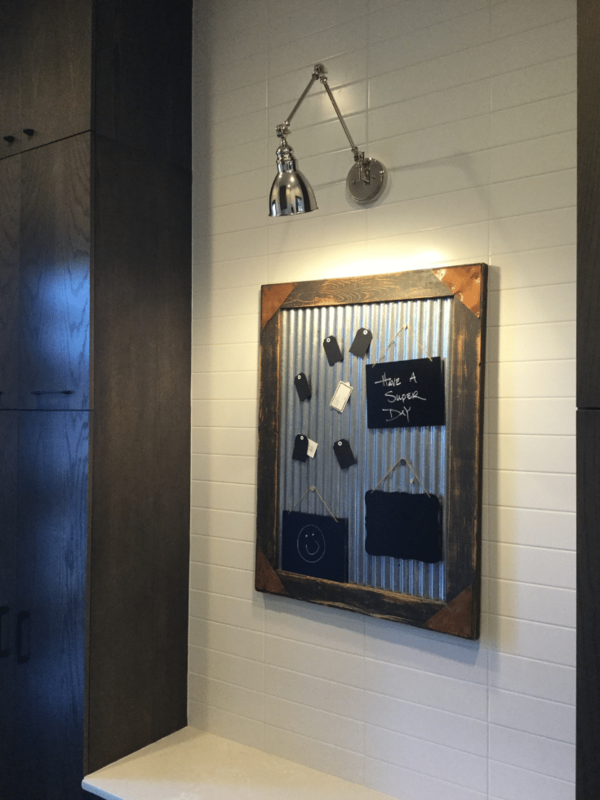 In the 3 Pillar Parade home they used a fun galvanized steel board with chalkboards for a place for notes, inspirational messages or to hang keys. 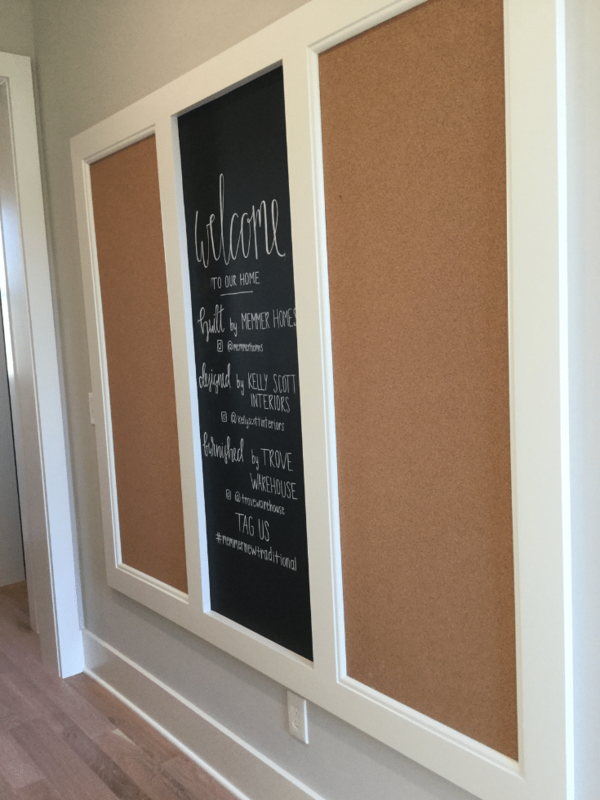 In the mudroom by Memmer Homes they created a wood frame with two corkboards and one chalkboard to foster more family communications. 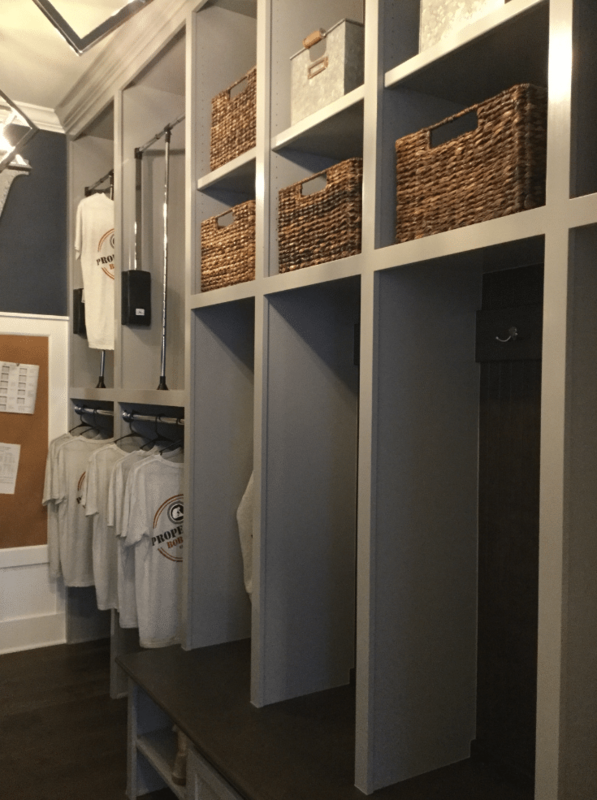 The open locker/cubby style mudroom sounds good ‘in theory.’ In practice it can be a source of frustration and angst if you’re the family member with more than a mild case of OCD. They used a combination of privacy doors and drawers. Door and drawers are a god-send if you’re family isn’t quite as neat as you’d like (OK – that’s a P.C. way of saying you think they’re a bunch of slobs). Keeping things inside pull out drawers and doors keeps the mess hidden from view (a good thing). In a perfect world, life would be simpler. You and your family would have less commitments, less stuff and live a minimalist uncluttered life (can you feel a sense of Zen overtaking you right now?). However, until your kids drop out of school (and you don’t need a place for their bookbags and sporting equipment) and you donate or throw our 75% of your coats and clothing and cleaning supplies, you need, need, need better systems to organize your family’s life. 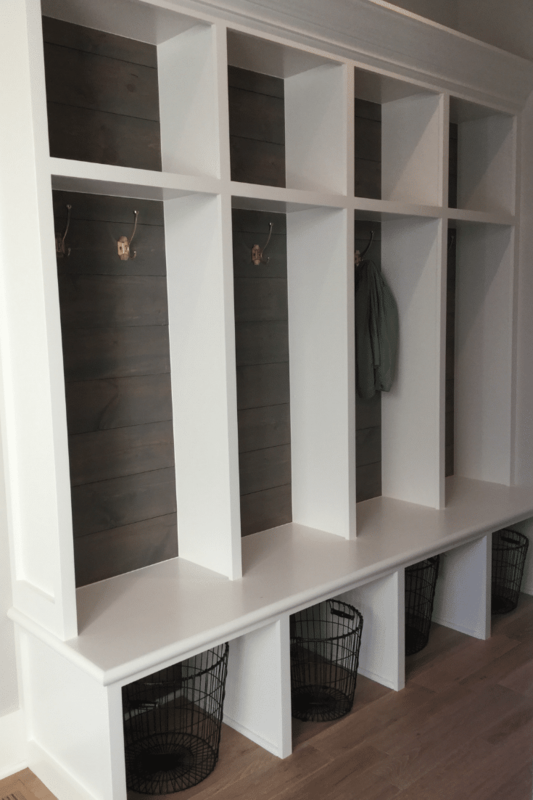 A custom mudroom storage system is a perfect place to make this happen. If you don’t have HUGE spaces like these Parade homes – don’t fret. Effective, efficient (and dare I say) exciting mudrooms don’t have to be large. Custom systems can be sized to fit your space – without breaking your budget. Now that school is in full bloom you may be struggling to find space and be organized. 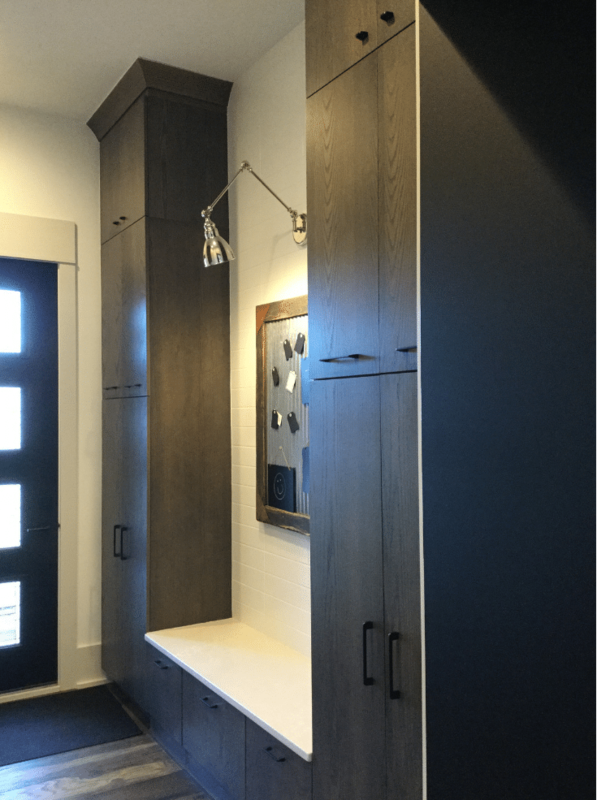 If this is the case – and you’d like to get ideas (and a Free 3D design) for a custom mudroom, closet, pantry or even a guest room, call us or click the links below. 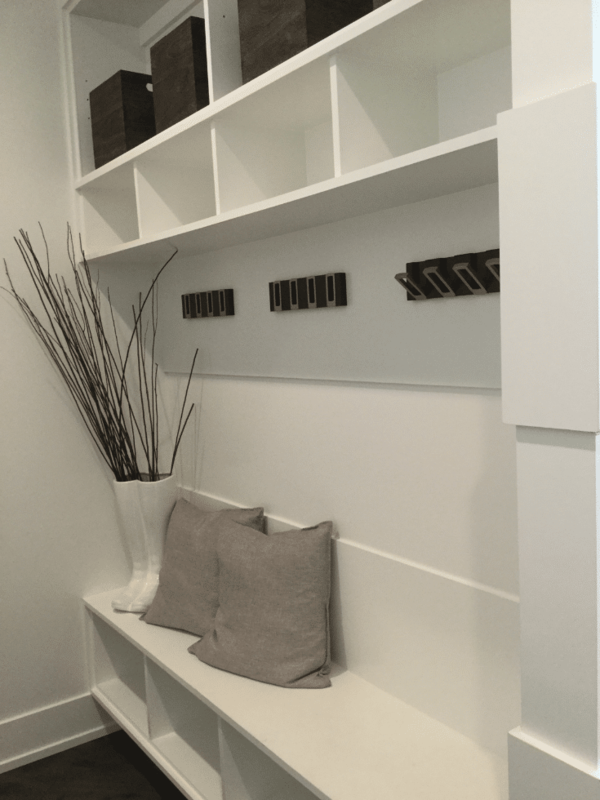 If you need help with a Columbus mudroom or entryway system and would like a Free 3D mudroom design, contact Innovate Home Org in Columbus at 614-545-6888 or in Cleveland 216-658-1290. For more information on organization systems and design (and a bit of wacky humor) follow me on Twitter @Mike_Foti or our companies’ @InnovateBuild and @InnovateHomeOrg.